The University Press of Florida (UPF) is the scholarly publishing arm of the State University System of Florida, representing Florida's twelve state universities. It is located in Gainesville near the University of Florida, one of the state's major research institutions. It is overseen by the Florida Board of Governors and publishes works from and about the state. Its predecessor was the University of Florida Press. Founded in 1945 and located in Gainesville, Florida near the main campus of the University of Florida, the University Press of Florida is the oldest book publisher in the state and one of the largest university presses in the Southeast. It was founded as the University of Florida Press with a commitment to books about the region, as exemplified by its first title, Florida Under Five Flags, a centennial history of the state by Rembert Patrick. UPF has published almost 2,500 volumes with a staff of 41. It has undergone a total conversion to electronic editing and production and boasts efficient schedules and procedures in place to release about 100 new titles each year in the areas of international studies, archaeology, dance, history, literature, political science, and many others. A member of the Association of American University Presses,  UPF ranks in the top-third of member presses for sales and new title production. By the early 1990s a need became apparent for one central authority that could refocus and unify the consortium’s publishing program, and the press was again reconfigured. The consortium of presses became University Press of Florida, a single press for the Florida State University System, with a single editorial board, a single imprint, and a single budget for which the director is responsible. 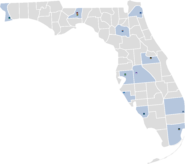 Today the UPF serves Florida A&M University, Florida Atlantic University, Florida Gulf Coast University, Florida International University, Florida State University, New College of Florida, University of Central Florida, University of North Florida, University of South Florida, University of West Florida, and the University of Florida.